Evo? I’ve heard that name before? Indeed you have. Aw the old Evo. A relic to the Lucky family and one of the first aftermarket scooter decks available. The whole deep roots collection is based off of one thing; our roots. Where we started, what we stood for, the product we made. We wanted to take everyone back to the good old days when it all started. We loved the original Evo but we felt it was a bit too heavy, so what did we do? We redesigned it. We combined our forged flat bottom deck with the old Evo like headtube but this time we made sure the headtube came permanently attached to the deck haha. The Evo comes reinforced and ready to take on any trick or handrail you throw at it. The deck isn’t the only amazing thing about this new complete though. Read the paragraph below to find out just how awesome this complete scooter is. What isn’t new!? 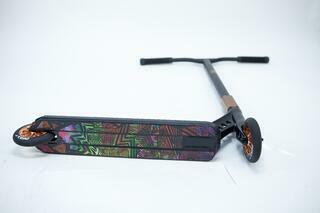 The Evo comes with the new Indy fork, the new Toro bars, 120mm Ten wheels, and the updated Lucky SCS. This out of the box complete scooter is the best of the best, our top of the line scooter, and a representation of the quality product we stand for. The Evo is for the serious rider who wants to throw huge tricks in the streets and the park. 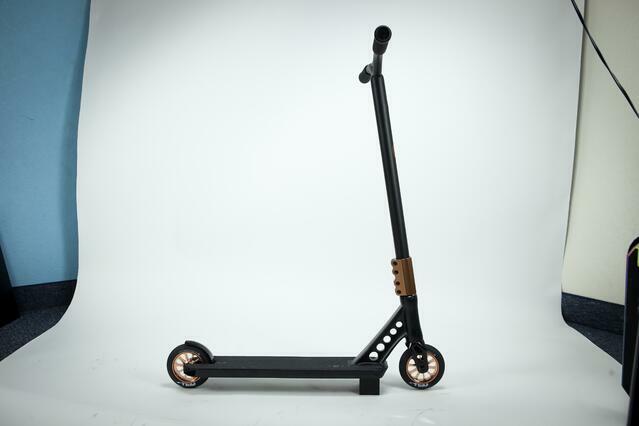 You can find the Evo at luckyscooters.com or at your local Lucky dealer!